(Women’s – ?) 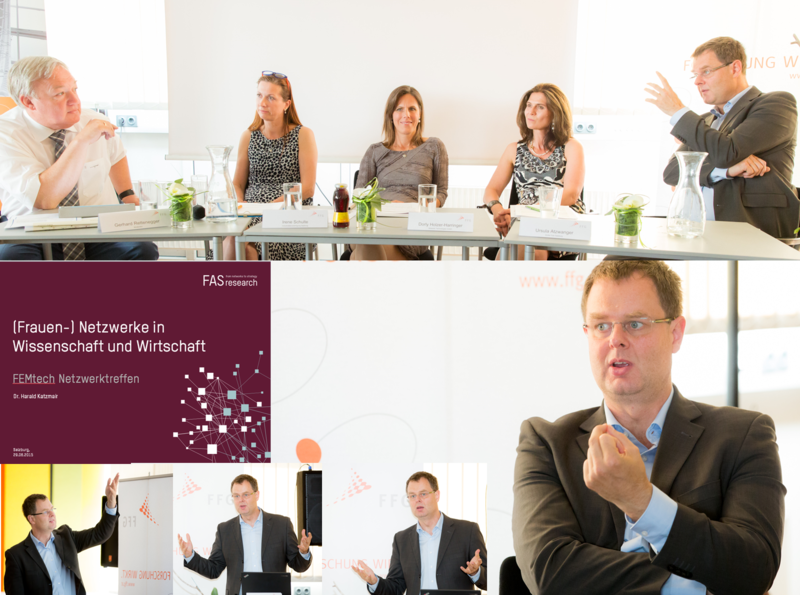 Networks in Research & Economy: In June Harald Katzmair was invited keynote speaker at the biannual meeting of FEMtech and talked on women’s share in research and economy. FEMtech is a programme of the Austrian Federal Ministry for Transport, Innovation and Technology (BMVIT) to promote equal opportunities in research and technology. Women should be specifically supported for this purpose and the framework conditions in industrial and extra-faculty research should be changed in such a way as to equally correspond to the needs of both women and men. The regular networking meetings allow participants to get acquainted with each other and exchange relevant information on the topic “Women in research and technology”. FEMtech provides information on news from the programme and highlights current topics. In addition, there is the possibility for an informal exchange and funding advice by the FFG. Daycare services are also offered for each networking meeting. Women and men who support FEMtech´s vision and would like to work together to improve the framework and access conditions for women in the area of technology and natural science, are sincerely invited to exchange information and experience!